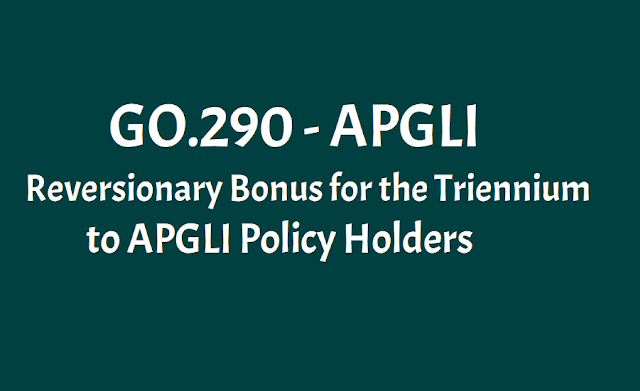 GO.290 - APGLI Reversionary Bonus [Rs.100/ for Rs.1000/-] to APGLI Policy holdersfor the triennium. Valuation of APGLIC Fund for the period from 01-04-2005 to 31-03-2008 || Reversionary Bonus of Rs. 100/- per thousand sum assured per annum || Declaration of simple reversionary bonus to the Policy holders || G.O.Ms.No. 290 || Latest GO's || Government Orders || APGLI Department GO's. Government of Andhra Pradesh, Finance Department has issued G.O.Ms.No. 290 on October 19th, 2013. This Government Order for Reversionary Bonus of Rs. 100/- per thousand sum assured per annum. This GO details as follow. Insurance – Andhra Pradesh Government Life Insurance Department – Valuation of the Andhra Pradesh Government Life Insurance Fund for the period from 01-04-2005 to 31-03-2008 – Declaration of simple reversionary bonus to the Policy holders of Andhra Pradesh Government Life Insurance Department – Acceptance of recommendations of the Actuary – Orders – Issued. 1. G.O.Ms.No.132, Finance (Admn.II) Department, dt. 25.06.2011. 2. Lr.No.30/General/2008-2009/2012-2013, dated:05.08.2013 of Director of Insurance, A.P., Hyderabad. In the reference 1st read above, orders were issued declaring the bonus for the triennium from 01-04-2002 to 31-03-2005. 2. In the reference 2nd read above, the Director of Insurance in his letter has proposed for declaration of bonus for the triennium for 01-04-2005 to 31-03-2008 based on the report of the Actuary. 3. After considering the report of the Actuary, and the recommendations of the Director of Insurance, on the results of Valuation of Andhra Pradesh Government Life Insurance Fund for the triennium from 01-04-2005 to 31-03-2008, Government hereby permit the Director of Insurance to declare the following bonus. a. A simple reversionary Bonus of Rs. 100/- per thousand sum assured per annum be allotted for each full month, during which the polices were in force between 01-04-2005 to 31-03-2008, in respect of policies which were in force on 31-03-2008. However, such of these policies which resulted into claim by death or maturity on or after the declaration of previous valuation results (for the triennium 2002-2005) and before the present valuation results are declared, are not allowed any bonus now as they were settled on the basis of interim bonus at the rates recommended in the previous valuation report. b. In respect of policies which become claims by death or maturity on or after the date of declaration of present valuation results and before the next valuation results are declared, interim bonus be allotted for each full month for which such policy is in force during the period from 01-04-2008 to the date of death or end of the policy as the case may be, at the rate of Rs 100/- per thousand sum assured per annum. In respect of policies surrendered during the above period, interim bonus is paid provided the policy is in force on the next valuation date also i.e. interim bonus is not paid for broken period of a valuation triennium. 5. The Director of Insurance, A.P., Hyderabad shall take necessary action in the matter accordingly.